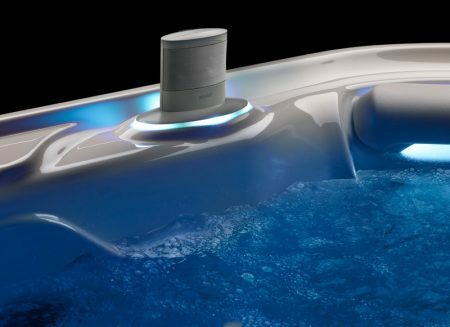 There are so many ways to enjoy audio entertainment with a Hot Spring spa. When you opt for a music-ready spa, you get built-in factory speakers. But if you want to up the ante on luxury, you can add a wireless Bluetooth® audio system, which allows you to connect your spa to your home entertainment system and other devices that are up to 150 feet away. Add a subwoofer, too, and you might never leave the water. On the best models, your spa’s control panel is a cutting-edge touchscreen that can be removed from its dock to act as a remote. The water-resistant remote has a 30-foot range and not only controls your audio entertainment, but also your jets, lights, temperature, and cleaning cycle settings, as well as the spa temperature lock and heating and cooling cycle timers. The music settings allow you to play, pause, switch tracks, adjust volume, and select different input sources, including media to view on your HD monitor. Artist names and song titles are displayed while the audio system is in use, to make your listening experience as convenient as possible. Your entire Hot Spring spa is designed to enhance your entertainment experience, as well. Whisper-quiet circulation pumps ensure that your listening is never disturbed by humming machinery, and ergonomic seats allow you to relax in total comfort while enjoying your leisure time. Whether you’re watching TV, streaming music, or listening to your playlist, a podcast, or an audiobook, Hot Spring offers the perfect listening options for you to fully customize your spa experience. 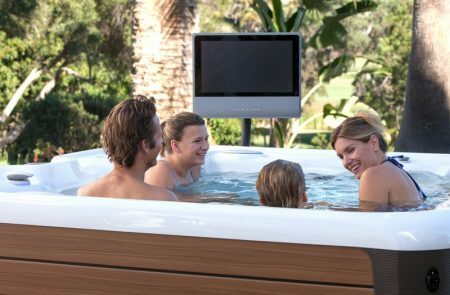 To enjoy live TV, stream video, and more as you relax in your hot tub or while entertaining in your backyard, add an all-weather, 22” HD wireless monitor to your spa. Our monitor offers excellent picture quality with 1080P screen resolution, tempered glass, and anti-reflective/anti-glare coating. HDMI-enabled, it connects to your in-home video sources or a streaming stick for a range of programming options. A monitor pedestal that slides under the base of the spa is included for easy mounting and installation, and a heavy-grade vinyl monitor cover (sold separately) offers additional protection and comes in a range of colors to match your spa cover.